I'm getting a little fed up with the continual stream of aberrant stuff that the Mars Rover keeps finding on the Martian surface. With all of this, you'd think that NASA would be all over the news with stories like, "Mars Rover Finds Proof of Life on Mars!" But no. Somehow, they're content to cover the stories up, and let Congress slash their budget over and over. Because that's how scientists roll. Coverups have a much higher priority than grants and funding, if you're a scientist. Or, perhaps, the people who are proposing these "finds" don't understand the concepts of "digital artifact" and "chance resemblance" and "pareidolia." 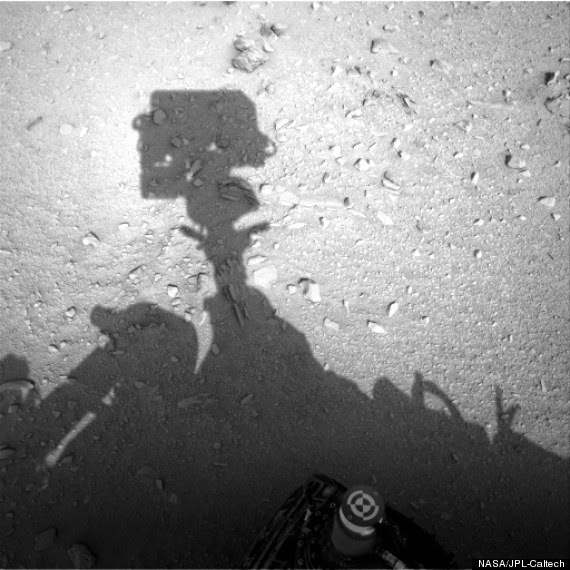 This last one is the reason behind the latest claim -- that the Rover caught a photograph of the shadow of a human (or other bipedal species) in a space suit, reaching out to make an adjustment of something. See it, there, on the left-hand side? Clearly a guy, doing something. At least that's the claim of Scott Waring, whose name has appeared here before, and always in connection to the aforementioned Martian stuff. Waring is always finding things on Mars. You have to wonder if he has a day job, or anything, or if he spends his every waking moment poring over NASA photographs looking for Martian bunnies. 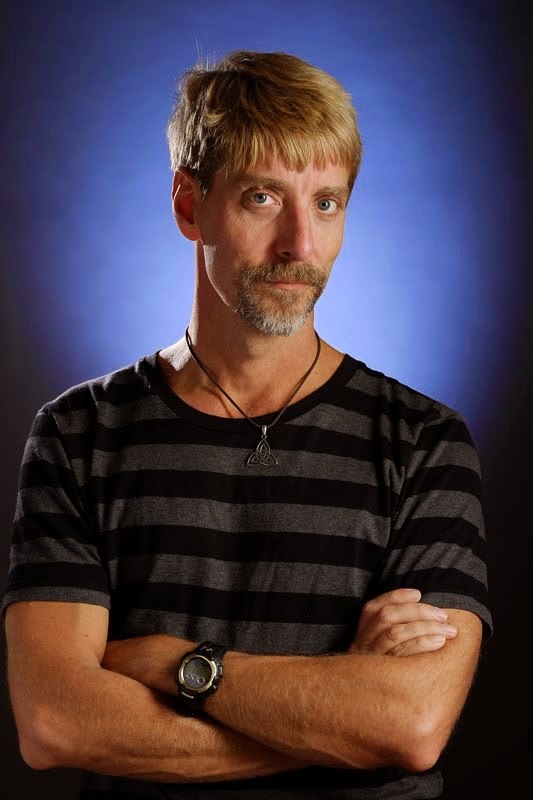 "Someone who wants to remain nameless has found a shadow of a human-like being messing with the Mars Curiosity rover," Waring writes, on his blog UFO Sightings Daily. "The person has no helmet and their short hair is visible and in high detail. The person has on air tanks on their back and a suit that covers most of the body except the hair." A human on Mars who leaves his scalp exposed? Mars is a little cold for that, don't you think? At least he should be wearing a wool hat. Someone should probably tell his mom. A vague shadow constitutes "high detail?" Waring thinks that there's only one solution to all of this, which is that there is a secret base on Mars, and this was one of the guys who lives there, making some kind of repair. Others, though, have suggested more ominously that this is evidence that the Mars Rover isn't on Mars, but is in some kind of studio on Earth where fake Martian photographs are taken, and the camera accidentally snapped a photo of one of the studio staff who didn't move away fast enough, and the people at NASA are so unobservant that they didn't notice and accidentally put it online for Scott Waring to find. What's interesting, of course, is that if you look at subsequent photographs, like the one below, you find that the "person" hasn't moved. At all. So the resident of the Mars base or the worker in the earthly film studio (whichever version you went for earlier) must have realized that he had been captured in a photograph, and so he stood there perfectly still so that more photos would be taken and he wouldn't be found out. 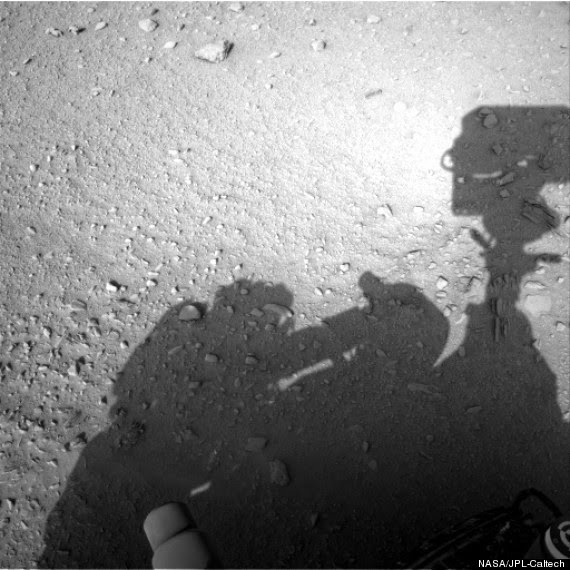 Or maybe, just maybe, this is the shadow of part of the Rover itself. As I've said before, no one would be more delighted than me if we found evidence of extraterrestrial life, whether on Mars or anywhere else. I would just think that was the coolest thing ever. But people who are actually using scientific methods to look for such evidence -- like SETI -- are not being helped by wingnuts like Scott Waring claiming that NASA is covering up evidence that socks that have gone missing in your dryer end up on Mars. So unfortunately, as we might have guessed from the outset, the human shadow claim turns out to be a non-starter. As have all of the other claims, which mostly have turned out to be weird-shaped rocks. (Except for the bunny, which was a piece of the Rover's landing parachute.) So the science-minded amongst us will keep waiting for good evidence, and everyone else will just wait until the day after tomorrow, when Waring et al. will be claiming that the Rover has photographed a giant Martian weasel. 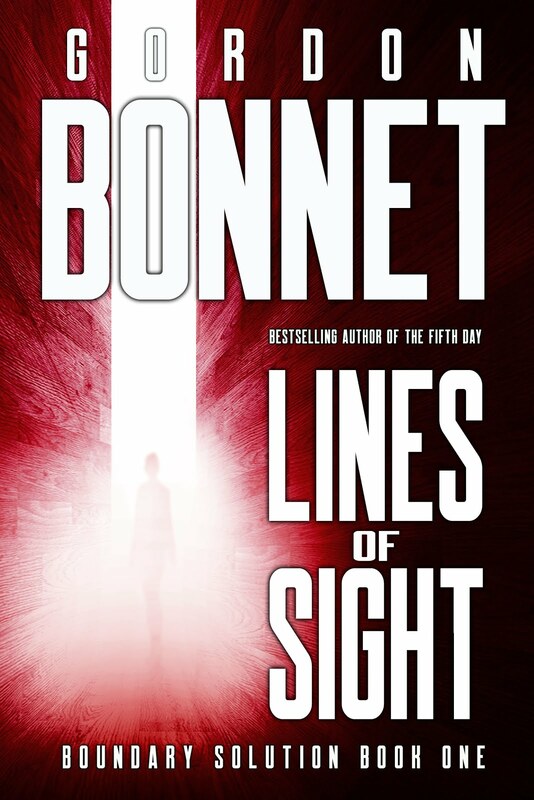 On the UFO Conjectures blog, RR was, for a while, leading us all on a merry dance around Mars by showing the occasional curious lines/angles or unlikely shaped rock. Some of the sceptical readers there (including me) and even some of the less sceptical types got sick of it and told him. We felt that apart from trying to be funny he was trying to f**k with our minds. He may have gone off the whole 'i-phone on Mars!' thing but we'll see, he may wish to f**k with our minds again sometime.